Investors have fallen in love with 10 stocks this year, and it could end badly for them if they don't do a valuation sanity check on each. 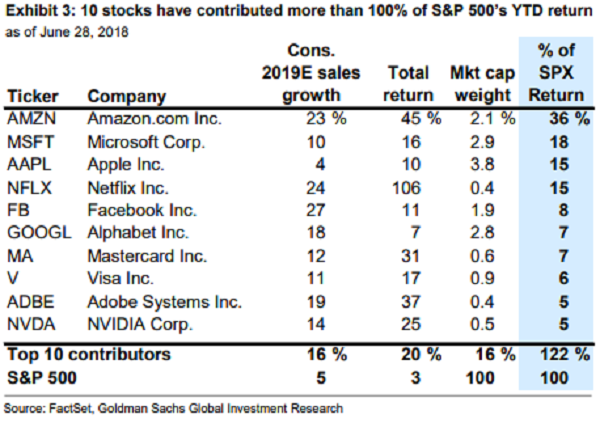 The top 10 performing stocks have contributed more than 100% of the S&P 500's year to date return, points out Goldman Sachs. Amazon's (AMZN sizzling 45% year to date return has contributed 36% of the index's total return. Other S&P 500 stocks have rallied even more in 2018, but have added less to the index's return due to their smaller cap weights. The five best-performing stocks are a who's who of momentum trades. These stocks are now arguably priced for the type of perfection that may not be delivered upon come earnings reporting time. Hence, they could be at risk of pulling back in the current volatile trading environment. The entire list can be seen below.